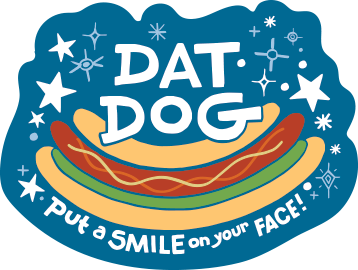 Dat Dog Enterprises, LLC ("Dat Dog") is committed to making our products and services accessible to everyone, including people with disabilities. To accomplish this, Dat Dog will be implementing the relevant portions of the World Wide Web Consortium's Web Content Accessibility Guidelines 2.0 Level AA as its web accessibility standard to the extent such implementation is compatible with our website design and doing so does not constitute an undue burden. Please be aware that although we believe our website to be compliant with Title III of the ADA, we are continuously making efforts to improve our accessibility. If at any time you have specific questions or concerns about the accessibility of any web page on our website, please contact us using our contact form at the following URL: https://www.datdog.com/contact. If you do encounter an accessibility issue, please be sure to specify the web page in your email, and we will make all reasonable efforts to make that page accessible for you. If you have questions or need any assistance with obtaining our products or services, please call us at (504) 418-5456 for our Restaurant Support Office, which is open Monday-Friday from 9am-5pm Central Standard Time. The office is closed for all federal holidays. We will be happy to assist you.